Pulled pork and pulled chicken are slow-cooked, tender, barbecue-style meats. 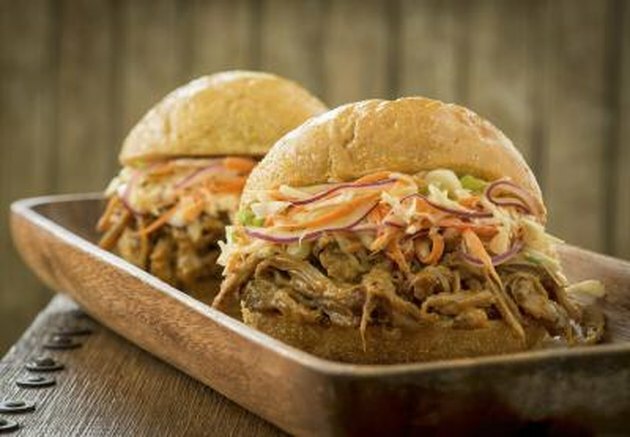 Although nutrition information can vary depending on the recipe, ingredients and chef, pulled chicken is lower in calories and fat than pulled pork, making it a healthier choice. Knowing the specifics can help you determine which meat works best on your diet plan. Whether you make your own pulled meats or purchase them ready-made, calories can vary. A 3-ounce portion of ready-made pulled chicken contains 90 calories, and the same size serving of pulled pork contains 158 calories. The same size portion of homemade pulled chicken contains 184 calories, and pulled pork 283 calories. If you're watching your calorie intake for weight loss or maintenance, the pulled chicken can save you 70 to 100 calories. Fat content also varies. A 3-ounce portion of ready-made pulled chicken contains 1.1 grams of total fat, 0 grams of saturated fat and 11 milligrams of cholesterol, while the ready-made pulled pork contains 6.2 grams of total fat, 2 grams of saturated fat and 37 milligrams of cholesterol. The homemade pulled chicken contains 8 grams of total fat, 2 grams of saturated fat and 68 milligrams of cholesterol, and the pulled pork 13 grams of total fat, 4 grams of saturated fat and 97 milligrams of cholesterol. Once again, when it comes to fat content, the chicken makes the healthier choice. Consuming too much fat, especially in the form of saturated fat and cholesterol, increases your risk of heart disease. While chicken is lower in fat and calories, pulled pork is a better source of protein. A 3-ounce portion of the ready-made pulled chicken contains 5 grams of protein and 15 grams of carbohydrates, while the pulled pork contains 11 grams of protein and 15 grams of carbohydrates. For the homemade recipes, a 3-ounce portion of the pulled chicken contains 20 grams of protein and 8 grams of carbohydrates, while the pulled pork contains 29 grams of protein and 10 grams of carbohydrates. When it comes to sodium, chicken once again makes the healthier choice. A 3-ounce portion of ready-made pulled chicken contains 294 milligrams of sodium, while the pulled pork contains 509 milligrams. In the homemade recipe, the pulled chicken contains 257 milligrams of sodium per 3-ounce serving, and the pulled pork 489 milligrams. Most Americans get too much sodium in their diets, according to the Colorado State University Extension. Too much sodium in the diet increases your risk of developing high blood pressure. Choosing lower-sodium options can help limit your intake.